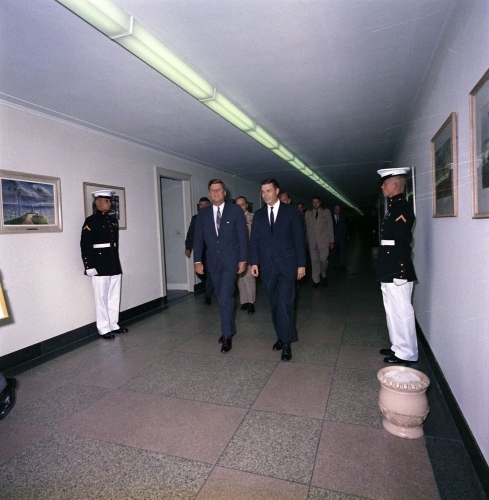 President John F. Kennedy walks through a hallway inside the Pentagon; President Kennedy attended a briefing session with representatives from the Department of Defense, Joint Chiefs of Staff, and North Atlantic Treaty Organization (NATO). Also pictured: Secretary of Defense, Robert S. McNamara; Chairman of the Joint Chiefs of Staff, General Lyman L. Lemnitzer (partially hidden); Deputy Secretary of Defense, Roswell Gilpatric; Naval Aide to the President, Captain Tazewell Shepard; White House Secret Service agent, Gerald A. "Jerry" Behn. Washington, D.C.